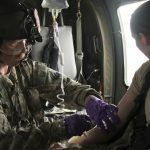 August 13, 2015 – JERICHO, Vt. – Recently the Vermont National Guard collaborated with the U.S. Army Medical Department Board (USAMEDDBD), the MEDEVAC Proponency Directorate and the Army Aeromedical Research Lab to evaluate five new flexible litters. Over a three-day period, approximately 35 Guard members tested and trained on hoisting the litter from both the ground and water. According to Dominguez, the USAMEDDBD is the only independent operational test and evaluation agency of medical-related materiel and information technology products, in support of the Army and Department of Defense acquisition process. They provide assessments of emerging concepts, doctrine and advanced technology applications applied to the delivery of health care on the battlefield and in fixed facilities. Five vendors participated in the litter testing. The different litters were designed for identified operational gaps in dismounted and rescue hoistable litters being used in theater. Prior to the operational test in Vermont, the litters went through a developmental and airworthiness testing. Soldiers with a medical background were selected from a variety of units within the Vermont National Guard. There was representation from the Vermont Medical Detachment, Aviation, Army Mountain Warfare School, Charlie Med., the 15th Civil Support Team and 131st Engineers. This is not the first time the Vermont National Guard has collaborated with the USAMEDDBD.